Scholarship applications are now open! There are opportunities for new members, renewing members, conferences, and more. Check our website for more details on how to apply. 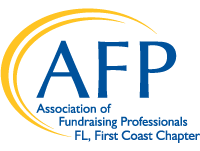 All members of the AFP First Coast Chapter receive our monthly E-Newsletter with important information regarding upcoming events, scholarships, and job postings. If you have any questions about the e-newsletter, please contact Julie Peterson.